Since the release of Pro Tools 12.5 a brand new feature is available within Pro Tools which enables users to collaborate online in real time. Users can work simultaneously on the same Pro Tools project which is a tremendous tool for producers and engineers who are not located in the same city/ region, etc. This addition to our favorite DAW is called Avid Cloud Collaboration. In this article I will walk you through setting up your account and profile, creating sessions – or better said projects as that is how the cloud collaboration version of the session is called – and typical workflow. Avid streamlined the process of setting up the new Cloud Collaboration system so that it is easy and straightforward for any Pro Tools user. The first step is to sign into your Avid master account by clicking the Sign In button located in the top right corner of the Dashboard. In the “Dashboard”, in the top right corner you can see the new “Sign In” button. You will be prompted to type in the e-mail and password associated with your Avid master account. You can select Keep Me Signed In so you do not have to do this every time. 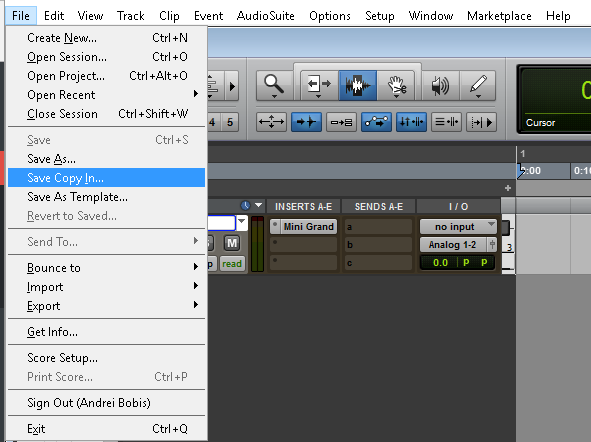 After typing in this information Pro Tools will automatically display the name associated with your account in the top right corner of the Dashboard. The next step is to configure your profile. In the Window tab there is a new field called Artist Chat. Click that and a floating window will pop-up that will let us continue our configuration. The new “Artist Chat” field in the “Window” tab. In the new window that just opened click on your name in the top right corner and then on profile to open up your profile information. Your personal information such as name and location will be automatically taken from your Avid account but you will need to choose a display name, which is the name other people will see. After choosing a name hit “Save” and you have successfully configured your Avid Cloud Collaboration profile. 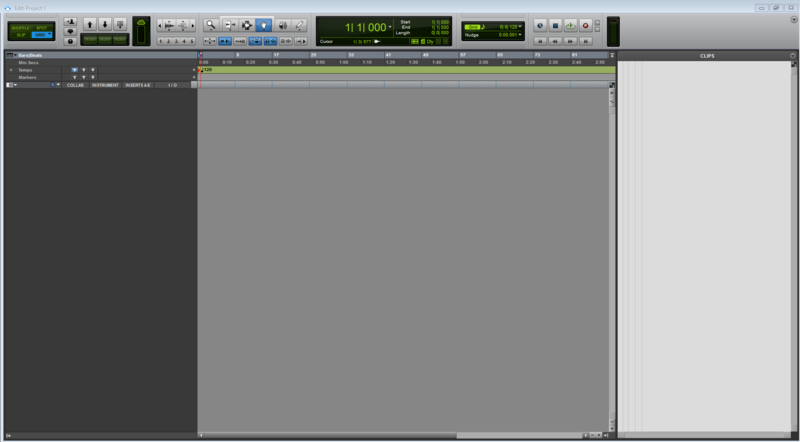 When Pro Tools fires up, the dashboard is the first window you see and since 12.5 it has a brand new tab called Projects. The “Dashboard” with the new “Projects” tab selected. So, what exactly is a Pro Tools project? 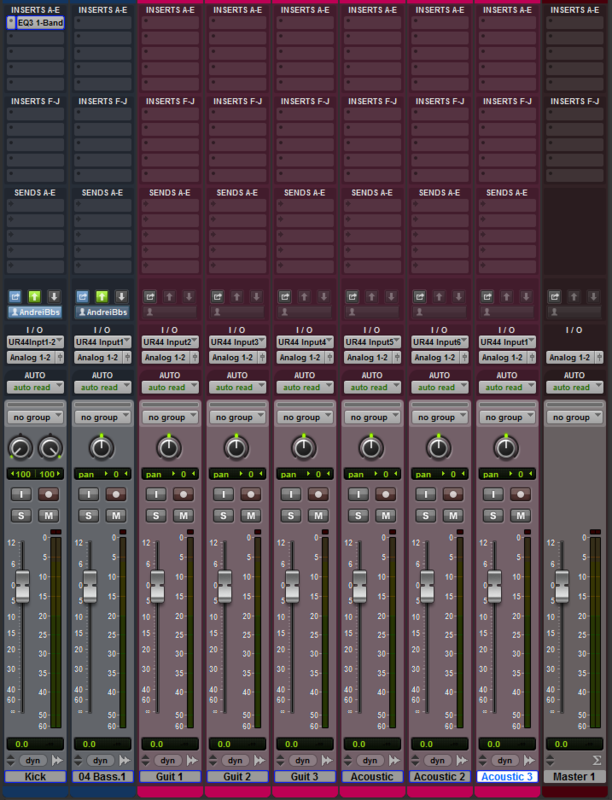 It is just like your typical Pro Tools session, only the cloud version of it. While all your local sessions have their folder stored offline, the new projects have all their files stored online. So it is just a new name for something you are already familiar with. Right now, standard users have a limited number of projects (three is the limit) and storage space that they can use but you can always get more storage space from Avid. In order to create a project you have to select the Create tab and select Project from the Type drop-down list. Creating a new project from the Dashboard. 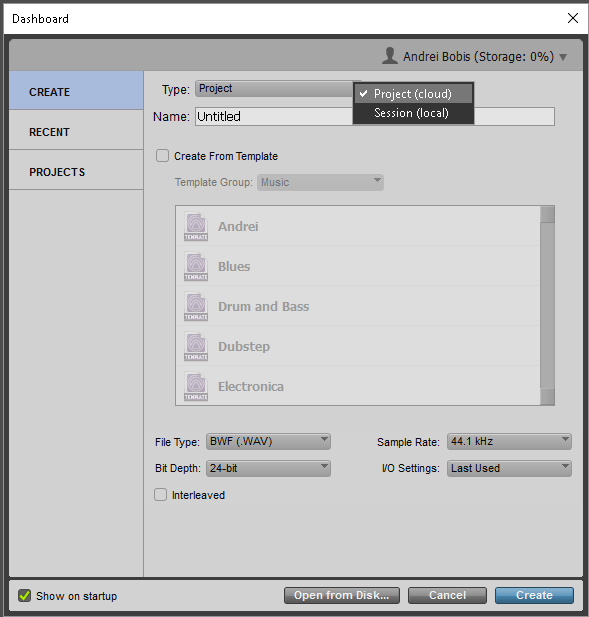 All the settings you are used to from typical local session carry on to the new cloud project – you can use templates, select bit depth, sample rate, file type and i/o. When you create a new project, it will load up just like a typical session and the main edit window and toolbars look a lot like a normal session, though some new buttons will draw your attention. The Edit Window of a Pro Tools project. The new buttons you see in your toolbar and lower in the edit window view section are your cloud collaboration tools. So there are two sets of controls, Global Collaboration Tools and Track Based Collaboration Tools. Let us take a look at what these control do for you. First, in the main toolbar, let us analyze the Global Collaboration Tools. Using the Global Collaboration Tools. Of course, you can select what you upload/ download on a track by track basis, in order to keep things organized and not to loose precious work. The first button in the track by track collaboration tools allows you to share a track. What that does is to upload that track to the cloud. Your collaborators can then choose to download it, if they want to. Sharing a track – or uploading it to the cloud. Whenever you make a modification to a track, any kind, the upward arrow on the track collaboration pannel will light up telling you that you can upload the modifications of that specific track to the cloud. For example, I sliced a bass track and instantly, the arrow turned green telling me that I can upload the mods. Notice how below the arrows my display name shows up to tell other collaborators that I have made the last modifications to that track. Similarly when someone else uploads a modification to a track, the little downwards arrow for that track will light up along with the global downwards arrow. In the Mix Window we will see another set of collaboration tools – the same set actually. Just above the I/O section of the tracks the same track by track collaboration tools are available just like in the Edit Window. Track by track collaboration tools in the Mix Window. Sharing a session you have been working on with online collaborators is super easy with the new cloud collaboration. Just open up the session you want to turn into a project and then click on the File tab and then click on Save Copy In…. The Save Copy In… command. The window allows you to change session parameters such as bit depth, sample rate and file type but it also allows to select what to copy to the new project. To save the session as a project click on the drop-down Format list and choose Project out of the list. After clicking OK you will be prompted to name the project. Saving a session as a Project. 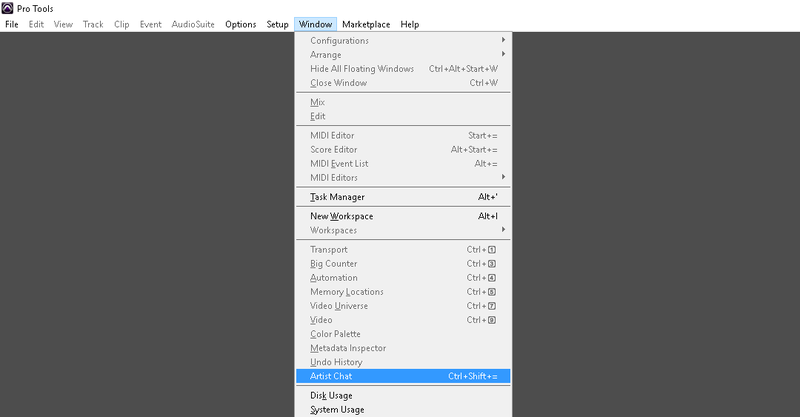 To open up the artist chat you can click on the Window tab and then on Artist Chat (or more simply you can press Shift+CMD+= / Shift+CTRL+= or click on the second interaction button that looks like a floating bubble in the global collaboration tools). This window allows you to manage your contact list and interact with your contacts. You can search for contacts in the Add Contacts tab or you can manage your known contacts in the My Contacts tab. Besides the Contacts tab you have a Notifications tab that will let you know about all new interactions or changes, the History tab where you can see all your past interactions or changes and two very important tabs: the Chat and Projects. The Chat tab is where you are able to chat with your contacts and the Projects tab is where you are able to invite collaborators to your projects. Being able to work on a project together with someone who does not live where you do is something I have wished for and I am glad that this exists and is implemented so beautifully into Pro Tools. Even if you do not work simultaneously with someone on a project it is so cool to be able to upload tracks and changes right from the program. Having to send over session files and audio files over the internet every time I make some changes to a session is really annoying but the Avid Cloud Collaboration makes this process part of the normal workflow of Pro Tools.